Wheatley is a character native to the Portal franchise who appears in LEGO Dimensions. 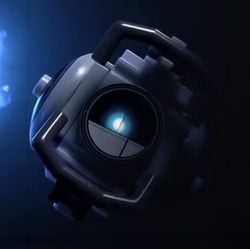 Wheatley is an Intelligence Dampening Sphere who was originally created to inhibit the decision-making ideas of GLaDOS. He was disconnected at some point and began making his own way around the facility, leaving GLaDOS's ideas of dominance unchecked and allowing her to take over Aperture Science completely. Described as "the dumbest moron who ever lived", he is the deuteragonist of Portal 2, and accompanies Chell as her guide for the first half of the game. After Batman, Gandalf, and Wyldstyle arrived in the Portal 2 World, GLaDOS managed to trap them in a broken test chamber. Wheatley helped the trio escape the test chamber and led them to a pipe he believed would lead them to safety outside the Aperture Science facility. However, the pipe led to another test chamber, which Wheatley only came to realise after he had sent them away. Wheatley is voiced by Stephen Merchant in LEGO Dimensions, who also provided the voice of the character in Portal 2.